I recently discovered that German baronesses and French princesses can be counted among my forebears, which might explain why I’ve still never set foot in a KFC. It would have been better if the witches hadn’t apparently spent absolutely everything, leaving me with nothing but their tastes, but this is what I’m now stuck with: Champagne taste and beer money. But Siem Reap isn’t a bad place to be stuck when you’re so afflicted. There is a way here of indulging the one without over-stretching the other in “afternoon tea“, one of the more civilised inventions, which can be comfortably enjoyed alone, together with a good book, or in the company of friends and family. It consists simply of a selection of delicately cut cakes and sandwiches, served with pots of tea or coffee. It’s slightly romantic and indulgent, and for some reason it makes you sit up straighter and put a jacket on your sibilants. But at the same time, it’s not stuffy at all, unless you really want it to be. It is one of those things we never think to do when at home, but which can make an otherwise ordinary afternoon a little bit more special, with a feeling of having been better lived. The hand waits, to pounce. Siem Reap’s longest running great hotel, Raffles Hotel Grand d’Angkor, of course runs a magnificent afternoon tea. Served in the lovely, colonial-style Conservatory Bar, for $19 (++) you can choose from a Khmer, Western or tropical afternoon tea. The first serves fresh fruit, Khmer desserts and a selection of snacks such as satay, prawns and wontons. The Western selection offers sandwiches, pastries and scones, while the tropical afternoon teas offer a mixed fruit salad, Khmer desserts and savoury snacks. Tea and coffee are unlimited. If that’s a little pricey, on Sundays the hotel runs an afternoon tea buffet for $13 (++), featuring a big selection of cakes, desserts, sandwiches, scones and snacks, as well as tea and coffee to wash it all down. 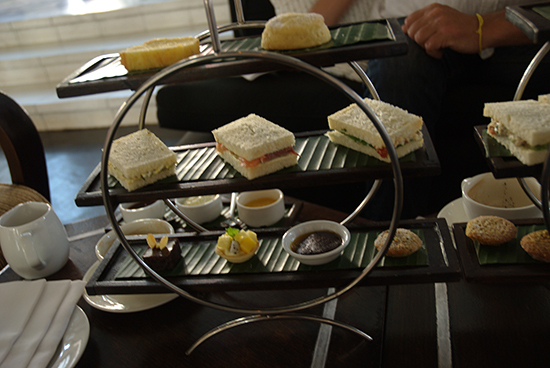 Nearby, the Victoria Angkor Resort & Spa offers two options for afternoon tea. For $8, you can enjoy some sandwiches and tea or coffee which you can have in the really gorgeous verandah overlooking the pool and gardens, or poolside if you like. For $14, the tea includes dessert and sandwiches. These options do not give use of the pool, but if the urge is overtaking you, you can opt to pay $18 for access to the pool, a 20-minute foot massage, plus a sandwich. For $12, you get open access to the pool. Further down the road, the FCC Angkor offers a small afternoon tea for only $5.50 which includes a ham and cheese sandwich and scone, plus tea or coffee. The FCC Angkor is a beautiful building that was once the governor’s villa and is one of those seminal places that makes it onto every romantic’s itinerary. And since you’re there for afternoon tea, you might as well stay for cocktails at happy hour. Le Meridien offers serves afternoon tea in the light and airy lobby overlooking the gardens. They offer cookies, chocolates and sandwiches and tea or coffee for $12 (++). I haven’t tried it yet, but their Italian restaurant L’Angelo is also highly recommended if you’re still feeling peckish afterwards. Last updated on 4th March, 2017.